Airport departures often have an unwelcome surprise since 9/11 and our Valentine's Day escapade was no exception. We were again taking Lufthansa's wonderful direct flight from Portland to Frankfurt but unknown to us, they had recently tacked on a $25 fee for any bag over 50 lbs, even though excess baggage charges didn't officially begin until 70 lbs. We had packed in 1 bag each for the 70 lb rule and so, like many others, we looked like refugees as we knelt on the floor to partially repacked our suitcases at the check-in counter. Fortunately we had an unused fold-up bag with us so we were able to evade the surcharge with only a little inconvenience. I assumed that the "non-excess-baggage excess-baggage charge" that didn't yet have its own name was a camouflaged fuel surcharge to offset the high oil prices. We managed to slip into Frankfurt just as the cold snap that had been gripping Germany for weeks was easing and one was beginning to set in in Portland. As a consequence, we narrowly escaped the snow and ice on both continents. But we were still met with a driving, cold rain in Frankfurt and we stopped to bundle up despite the shortness of the walk from the train station to our hotel. Our flight shorted us a night's sleep and landed us in Frankfurt at about noon their time. The buzz of traveling made a nap seem out of reach so we layered on all of our warm clothes and cycling rain gear and braced ourselves for a walk along the Main ("mine") River. The icy wind quickly weakened our resolve and we happily detoured across the river to the beckoning banner for a temporary Egyptian exhibit. Lack of sleep was hardly good preparation for a studious afternoon at the museum but our upcoming trip to Egypt and the near-freezing cold compelled us to try. It was a war of wills to stay alert enough to focus on the artifacts and to read the free brochure that detailed the exhibit theme, which was the one-way flow of artistic influence from the Egyptians to the Greeks and Romans. We had to constantly change the demands on our brains and bodies to stay awake, including occasional brisk walks in the stairwells and closed-eye rests on the benches. We managed to get through the whole exhibit and I was pleased that when in Egypt a few weeks later I even remembered some of what I had learned. 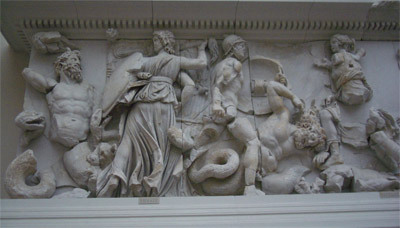 The Pergamum Alter frieze from 170 bce. Our centrally located Ibis Hotel in Frankfurt has dark, tiny rooms, so we were eager to head on to Berlin. We knew the weather wouldn't be any better but hoped the Ibis rooms there would be larger. We love the Ibis chain (their holding company Accor now owns Motel 6) as they have great rooms for jet lag recovery. Good beds, good plumbing, sound proofed rooms and heavy curtains are just what we needed for recalibrating our biological clocks. There are only slight variations in the decor from city to city, but the room sizes vary quite a bit and we gambled and won--our newer East Berlin location was both more spacious and brighter. The winter special of 49 € (about $59) compared with their usual price of 74€ was part of why we selected chilly Berlin for our jet lag recovery. It was a bargain price for a European city and being in Berlin would allow us to mix in a light sightseeing schedule with lots of time fore sleeping. We didn't get the low-priced Wifi or English on our TV that we hoped for, but the single, free internet terminal in the lobby was a huge help for keeping in touch. 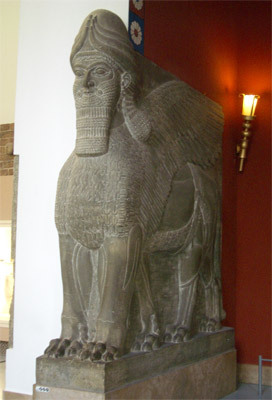 1000 bce Assyrian palace statue. Jet lag recovery went better for both of us than ever before and we are guessing that being less harried in our last days at home made the difference. We were calmer and more relaxed when we departed Portland and we suspect that difference had set the stage for more ready sleep despite the time zone confusion. Instead of wandering around Frankfurt and then Berlin as zombies from the haze of a 9 hour time change, we actually felt reasonably comfortable after our first night's sleep. We didn't press our luck by trying to read for hours, but did have the concentration needed to enjoy the planned museum hopping. Our week in Berlin was split between visiting their many museums with exhibits that are still being reshuffled after the merging of East and West Berlin in 1989 and organizing our trip to Egypt. We were pleased to gain entrance to a prehistory museum in Berlin that had been closed when we were there in 2002 and enjoyed the various antiquities museums that have prized finds from places we've visited, like Pergamum in Turkey, and places we aren't likely to see, like Iraq. We also toured the very unusual but effective memorial of over 2711 concrete stelae of different sizes with the not so subtle name of "Memorial to the Murdered Jews of Europe". Egypt came up by chance as we left Frankfurt in December as a pleasant alternative to biking in the cold February weather in Europe. A few weeks in Egypt's mild winter weather would give the snow on the continent a chance to recede. Picking up our bikes in Florence at the end of March seemed like a better time to start our touring year than mid-February. "Vogelgrippe" or bird flu was quickly added to our German vocabulary as the first cases in wild birds were identified on Germany's North Sea coast just after we arrived. Bill deciphered what he could from the unfolding German TV news stories about the crisis. We of course knew last fall that bird flu was going to be a consideration during our 2006 travels but didn't expect to be factoring it into our plans during our first days of travel. The bird flu in Germany wasn't of too much concern to us as we have more confidence in their bureaucracies than in most countries but going to Egypt was another matter. One evening I thought I heard a passing reference in German to Cairo and sure enough, a little searching on the internet the next morning confirmed cases of the dreaded H5N1 virus at the Cairo zoo. Egypt was not the place we wanted to be during a human pandemic, so we found ourselves thrown back into the tedious business of risk assessment. 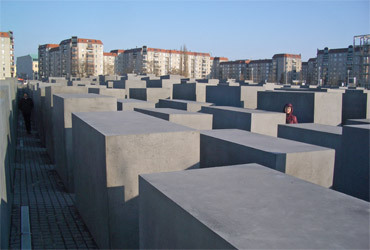 The just opened "Memorial to the Murdered Jews of Europe." We were preoccupied with risk assessment much of the last half of our 2005 touring season and were frankly tired of it. Last year it was weighing the risks of land mines and crossfire in and around southern Serbia against heavy international truck traffic in Bulgaria and then debating if the risk of being victims of terrorism in Turkey was too high to accept. A trip to Egypt carried some terrorism risk as attacks on resorts in 2005 reminded us, but we had already made peace with that. But we hadn't expected the bird flu issue to pop up days before we were to buy our tickets for Cairo. Avoiding birds and especially dead birds is pretty easy for us to do, so we didn't feel like our risk of contracting the disease was particularly high. Greater was the concern about the virus suddenly mutating to a human-to-human transmittable form--a possible but not certain risk. After using the internet to inform ourselves as best we could of the unfolding bird flu situation, we finally decided to commit to our Egyptian junket. Bill vied for time on the single terminal in the hotel lobby as he shopped for flights departing from a number of European cities. Once the flights were set, he secured reservations for our first night's lodging in Egypt and for our return nights in Berlin and then Florence. One last problem was to be solved, which was our extra luggage. We had brought 2 overstuffed, throw-away-grade suitcases with us to Europe but only wanted to take 1 with us to Egypt. Hauling a heavy, disintegrating suitcase with bike chains and cables, cycling shoes, a new saddle and a small library of European guidebooks was too burdensome and our hotel would not stash the suitcase for the needed 3 weeks. We emailed a German couple newly settled in Berlin that we met during the Serbian heat wave last August for some logistical support. Jörg and Imme kindly agreed to keep our suitcase that was getting more frail with each leg of our trip. And we also appreciated their willingness to receive my renewed driver's license that wasn't available before we left the States. Having to return to Berlin to retrieve our suitcase and mail added some expense and inconvenience but it was the best plan we could devise. We'd fly back to Berlin from Egypt for a 24 hour stop-over and then take a late flight to Pisa and then a train to Florence where our bikes were in storage. With our Egypt trip set and our extra bag stashed, we turned our attention to visiting the Schmidt's, whom we had met in 2002 in northern Germany on their first-ever bike trip. A little older than us, they were East Germans who had grown up and turned gray under communist rule and the harsh control of the Stasi, the secret police. 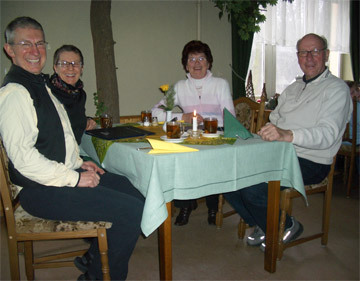 They had treated us to quite the visit and sightseeing tour of their area near the Polish border when we stayed with them for the better part of a week in 2003 and were looking forward to seeing them again. Lunching on regional specialties with the Schmidt's. Bill was once again taken under Siegfried's wing like an elder clansman passing on his wisdom to the next generation. Siegfried systematically explained whatever was before us in detail, taking as many lengthy diversions as needed to explain the words and word usage that Bill needed to understand the concept at hand. Bill got the German language experience that money can't buy: a teacher who was both passionate about explaining the world from an East German perspective and weaving vocabulary and grammar into the process. It was likely more intensive than a college student's exchange program as our host wasn't just immersing Bill in the everyday use of the language but also was enthusiastically instructive about it. The hours of intense concentration made Bill's head spin though he reveled in the opportunity for such a customized language program. I couldn't come close to keeping up with the conversation with my fledging "traveler's" German skills and designed my own language program. At times I focused on just being able to separate individual words in the conversations, recognizing a few here and there. My always ready English-German dictionary on my handheld computer let me track down new words I couldn't glean from the context of the conversations or from museum displays. And after a few days I amused myself by listing all of the words I spotted from the newspaper or conversations that were identical or quite similar to English--words like "Hering Salat" that indeed translated to "herring salad." For anyone going to a German speaking country that would like to quickly boost their German vocabulary by over 200 words, take a look at my Easy German Words file under "What, How & Why" and then "General Travel Issues", which was a product of my self-styled linguistic program. Our visit was of course also a cultural as well as linguistic immersion. Three meals a day we dined on tradition German winter faire which usually included a half dozen kinds of cured meats, a couple types of wurst, 2 or 3 cheeses, pickled foods like herring and the delicious heavy German breads. The Schmidt's were very deliberate about their shopping, selecting fresh eggs from nearby farms and as possible, buying their meat products from local butchers using traditional preparation techniques. Jams, jellies and other specialties came from their summer labors stashed in the cool cellar. Though the same array of fresh produce was in the local market as at home, their bias was towards more preserved foods. The bounty of rich foods threatened our waist lines, as did the daily mid-afternoon coffee break featuring home made and purchased pastries--things we normally only eat a few times a year. Prewar memorial to the now defunct textile industry. We again delighted in hearing the details of life in Eastern Germany and realized that if it could talk, their house itself would tell quite a story. Siegfried's folks built it for their young family of 2 boys in 1938 and by 1939 there were 4--Siegfried being 1 of a pair of twins. It wasn't long and Papa was off in the war, leaving a young mother struggling to feed the children. Over the war years, other people made homeless by the hostilities were taken in and wounded soldiers tended in the cellar. But by February of 1945 everyone under the roof was on the run. What possessions could be loaded onto a wooden wagon were then pushed west to avoid the advancing Russian front. Their prized new house that had sheltered so many in its first few years was abandoned and the hungry young family and their guests took shelter some miles away in a 1 room home with a farming family. But the front advanced and the now larger group headed towards Berlin until the Russians overran them in May. Pushing their wagon, the family returned to reclaim their home which was among the few to survive. There were bomb craters in the yard, but the house was spared. Some of the abandoned belongings that had been carted off by others were located around town and returned. 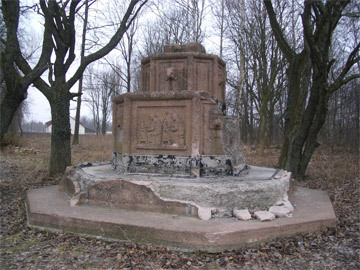 The once prosperous city was in shambles and the part of town across the river was partitioned off as a part of the redrawn Poland at the end of the war. Fourteen to 15 people lived in the 2 bedroom house for the post war years, with Papa returning in 1949 after a stint as a POW in Russia. Over the years, the housed refugees found other homes and the occupants dwindled to 4 or 5 family members until the 1990's. The house built on Mama's family's large garden plot was both a source of security and a burden over the decades. The commitment to his parents and the homestead kept Siegfried from fleeing from East Germany as 2 of his brothers had done when the government slowly boxed its citizens in, cementing it with the infamous wall in the 1960s. The house was the only form of investment possible in the communist era and the large garden and nearby full-acre garden helped to feed the family in the many lean years. The house served as a benchmark for a gradually improving way of life. The toilet came in doors in the 1960's as did other running water for the first time. Central heating arrived in the 1970's. And 10 years after the 1989 fall of The Wall, the interior of the house was completely remodeled. Oil heat replaced the always messy coal, walls were knocked down and pushed out, insulation and all new windows were installed. The 1938 house that had seen small improvements with difficult to obtain materials during the communist regime was transformed into a gracious, modern home with much of their own labor. But the sudden prosperity that followed "The Wende," the reuniting of East and West Germany, was followed by economic collapse. The lovely remodeled home was now in a severely depressed area and the effective market price was less than the cost of the renovations. Foreclosed homes in the area were offered at half of their assessed price by the banks, making their fine home a suddenly illiquid asset. The now-graying couple that had planned on moving on by now was again constrained by their commitment to a home that had been a mixed blessing over the decades. It will take a sudden and dramatic shift in Germany's economic woes to get them out of this fix--something that isn't expected any time soon. We had wondered what we would do during the days for our 5 night winter visit with the Schmidt's as during our summer of 2003 visit, it seemed that they must have exhausted all of the local sights. We had gone on a favorite boating tour on a local river; attended an unusual bike race that paired bikes with motorcycles; learned about the huge textile industry that once thrived in the region; visited a reconstructed 800's ce fort that was discovered during coal strip mining; and had seen many aspects of the massive coal operations and reclamation projects. And then there were the many leisurely meals in their lovely garden. But they surprised us with more outings. 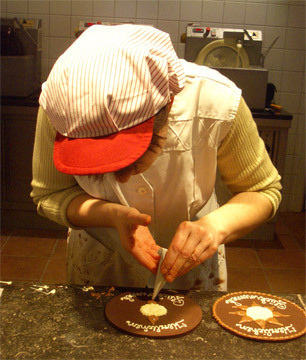 On this visit we dropping in on a chocolate factory started since the reunification of the 2 Germany's by a young Belgium couple and stood on platforms at the famous Durbin glass making factory and watched the production process. In addition to learning about these new and old industries, we visited to the city hall for a small traveling exhibit on the techniques used by the Stasi for opening peoples mail. And it was at this exhibit we learned that the state run store of luxury goods was in part supplied by goods confiscated from the mail that was being sent as gifts to hungry relatives in the communist republic. One of dozens of workshops at the WWII munitions factory. 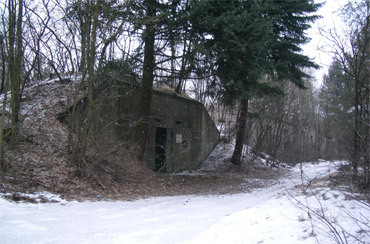 And on one snowy day, we took a jaunt across the now Polish border to what was a part of their town before the end of the war to drive through an abandoned WWII munitions factory. Until a few years ago it was possible to take tours of the buildings but a careless smoker triggered an explosion and ended that enterprise. It was eerie to realize that the multiple buildings had been intentionally widely spaced just because of the explosion hazard. In hearing of the Schmidt's experiences, it was striking how different their reference points are from ours and we were reminded how lucky we'd been to have lived relatively dull lives. The reference points in our adult years have included the Viet Nam War, Watergate, stagflation, 9/11, and a string of Middle East wars--all things that, especially for Oregonians, were far away. The reference points for the Schmidt's who are a little more than a decade our senior are so different from us and those points are all so much closer at hand: "Before the war", was the war whose battlefield included their homestead; "1989" of which they chipped out a piece of the collapsing Berlin Wall for themselves; "after the Wende" or reunification, which still shapes their lives; "the West Germans" who treat them like second class citizens, including the German ex-pats in Australia; and "The Poles" who are only yards away living on the land that once was part of their city. They've made peace with their chaotic history and yet the emotions haven't all dissipated. Siegfried was pleased to locate a wine glass with a Stasi emblem on it from his cupboards, to hold in his hand a little piece of a huge machine that dominated their lives for decades. The emotion in his voice was unmistakable when he spotted an elderly man on the street who had been a dangerous party member not many years ago. And then there were the heartfelt hugs in the market with a young woman who we later were told was the granddaughter of the family that took his mother and 3 brothers in as they fled the advancing Russian front. She wasn't even alive then but the bonds formed 60 years ago were being passed down through the generations. Once again it was incredibly clear to us just how different our lives had been from those of the Schmidt's. For all 4 of us, our lives had centered around our educations, our careers, and our families, but for us our government had for the most part had provided a supportive social and economic structure that created a generally improving environment, whereas in East Germany the opposite had been true--they were frequently having tumble with political upheavals and dramatic social changes that defined their lives. After an interesting home-stay with the Schmidt's in their village on the Polish border, we made the 2 hour train trip back to Berlin. The next morning we left our airport hotel before sunrise to fly to Cairo, changing planes in snowy Zurich.. We expected about a 40 degree temperature jump when stepping off the plane in Egypt and were also looking forward to standing in the sands that had been the backdrop for so many artifacts we'd seen in European museums. This 3 week visit on a new continent would serve a dual purpose: it would delay our cycling season until Europe had shaken its winter chill and it would be the spice for a year expected to be very satisfying but a bit short on the "wow" factor. We are in Florence, Italy and will begin our 2006 cyclotouring season tomorrow morning. We completed our 3 week prelude to the season by visiting northern Egypt without our bikes--a challenging and interesting trip. We've had a little set back and unexpectedly had to replace both of our rear wheels, but more about that later. The current 60°, partly sunny weather is a delightful way to begin the biking year and we are looking forward to being out on the road. The outline of our itinerary is as follows, with more detail to come as it unfolds: We'll begin by traveling south to Sienna for a few days, then west to the coast of Italy. We'll then wind north on the Ligurian coast toward Genoa, and then on toward Torino, reaching the Valle d'Aosta by mid-May. Then we'll turn east to Bolzano and into the Dolomites again this year, reaching them in early June. We'll be across the Alps by early July and will arrive in southern Austria near Salzburg. Then it's north again through the heart of Germany to the North Sea by the end of August or early September. We'll hook left into the Netherlands and then Belgium, and be ready to fly back to the States in early to mid-October. PS: Let us know what you like and don't like about our webpage, the journal updates or the photos. We received a few requests while back home and always appreciate the feedback. Of course, we get conflicting requests like "I love the history lessons" and "Please, no more history" but we still appreciate the comments and we'll do our best to honor them.